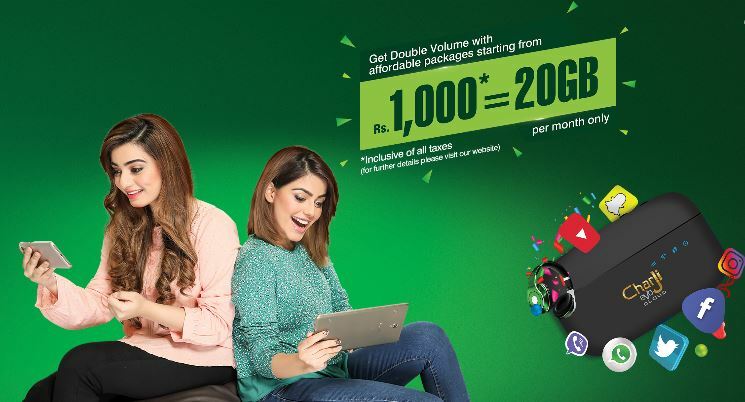 PTCL launches a new offer by which purchase, recharge or upgrade to new CharJi device before 30th April and get double the volume on each recharge for next 3 months. According to details, the volumes of CharJi EVO packages have been doubled for potential customers, conferring tremendous value upon the subscriber. The offer enables subscribers upgrading, recharging or purchasing CharJi EVO LTE to receive twice the volume for the same monthly charges. The Doubled volume tariffs are also applicable on every subsequent recharge for the next 3 months. The offer enriches the lives of our customers, providing copious volumes to help meet their daily data & communication needs. Get double the volume with every recharge for the next 3 months! Wi-Fi functionality allowing up to 10 Simultaneous connections at a time depending. Promotion is valid for new & existing CharJi EVO subscribers and 3G subscribers upgrading to CharJi. Offer is valid for purchases/recharges made before 30th April, 2018. Double volumes are valid for the next 3 months. Upon expiry of volume validity period, packages will revert to standard commercial offering.